Applied Processor and Measurement, Inc. provides the following current controlled proportional and peak and hold drivers for solenoid / valve development, automotive and industrial applications. 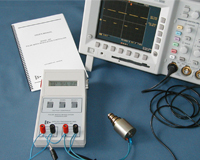 The Model 805 PWM Driver / Controller is a signal conditioner style PWM Driver. 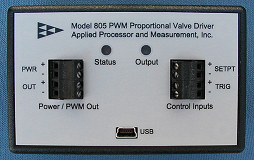 The Model 805 features current controlled proportional and peak and hold PWM solenoid control modes and is designed for stand-alone, PLC or computer control applications. The Model 205 benchtop style PWM Controller provides current controlled proportional drive for solenoid / valve test and development, automotive and industrial applications.